Waukon Feed Ranch Mill produces feed for pigs in Northeast Iowa; grinding over 2000 tons of feed per week for sow farms, pig nurseries and hog finishing sites. WFR’s mill supports the local corn market by purchasing grain directly from area crop farmers. The WFR Mill has been a cornerstone of the business for several decades and part of Waukon’s landscape, located in the southwest corner of the community. Waukon Feed Mill is pleased to be a distributor of Hubbard Feeds. 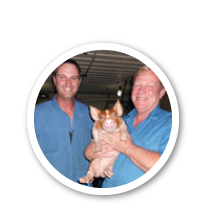 The Mill handles all types of livestock feed and pet food. Call or email WFR’s Mill Manager, Jerry Hilgerson for more information: 563-568-4472 or cowboy@waukonfeedranch.com.